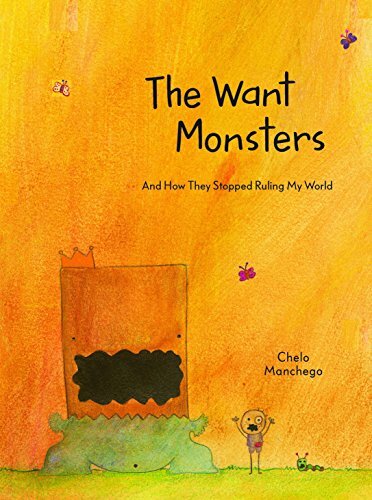 Chelo Manchego tackles a poignant and universal issue in his book The Want Monsters. In our consumer culture that values more, better, newer indulgences, Machego’s book offers a unique perspective by tackling the screaming tantrums of desire with awareness and acceptance. In the story, a no-named, stick-figured, one assumes but is not quite certain, boy narrates to the reader the concept of the Want Monster. His own want monster, having been granted free reign over his life, is “ginormous.” The reader is told that want monsters are not good not bad, they just are. Want monsters can’t be fought, they are too strong; they can’t be outrun, they are too fast; and they don’t listen to the word no. They are there when eating too much junk food, when playing video games for too long, and hanging out trying to impress friends. They are ever present, everywhere, within everyone. While the child has no name, no gender, and is diminutive in stature, it is quite clear that the monster is Oskar, a male, and has the ability to change sizes. When allowed to rule the roost, Oskar is ten times the size of the child. When kept in check, Oskar becomes pocket sized. Yet Oskar never gets so small as to simply disappear. The point of all this growing and shrinking is that people, if they are aware of the dynamics of want, can control their desires. If one can recognize when the monster is exerting its influence over decision-making, accept its presence in one’s psyche, then its impact is lessened. A fair premise albeit a “ginormously” abstract message. With such an esoteric concept at stake, it would be possible to bring it down to earth with illustration and design techniques. The artwork is entertaining, if not tilting toward the bizarre, but there are a few quirks. The first, and possibly most obvious, is that with so much page available, the illustrations are forced to reside at the foot of the pages. This location leaves a lot of empty space filled up with a wildfire of color that can distract the reader from both the illustration as well as the superimposed typography. The background competes with the drawings, and plot driving subtleties are swallowed up. A further oddity is that the drawings are itty bitty, pocket-sized. One can barely see the caterpillar, who is the wise catalyst for self realization, marking the turning point in the child’s understanding. Equally teeny tiny is the pocket itself, which is supposed to contain the manageable representation of the Want Monster. While the reader will be stretching their mind to grasp the concepts in story, they will be straining their eyes to see the nuances of the illustrations. Finally, Manchego's artistic liberties raise distracting questions, some of which have nothing to do with the story. Why does the child have one small black dot eye and one larger white circle eye? What is on top of the child’s friend’s head when giving each other a high five? What is in Oskar’s thought bubble when he is sitting on the sofa watching TV? And why is the very same illustration used for when the boy eats ice cream as when he is watching TV? Equally puzzling are some of the statements the child makes. Why, when there is no other Spanish word in the entire book, nor any reference to a Spanish tilt to the story, does the child blurt out “no más!” when frustrated? Why does the child say over and over that he keeps “minding my day” whenever Oskar misbehaves. What does that actually mean? How does one go about minding? How does that relate to the caterpillar’s solution to “let Oskar be Oskar”? Only the child doesn’t let Oskar be Oskar, he wants Oskar to want other things. He wants Oskar to veer away from wanting ice cream, video games, and notoriety and try for kindness and sharing instead. Yet this only spurs on more wanting, which, one thought, was what the book was trying to diminish. On top of all of this emotional confusion, it seems the child thinks it’s important to not only tolerate Oskar, but to really love him. Why does the child need to love his Want Monster? Why is it important for the Want Monster the love him back? All of this is pretty intense. So here is presented a complicated theme with an offbeat delivery. It makes an interesting first impression but is probably better suited to adults looking for a way to initiate conversation rather than a go-to favorite for story time.